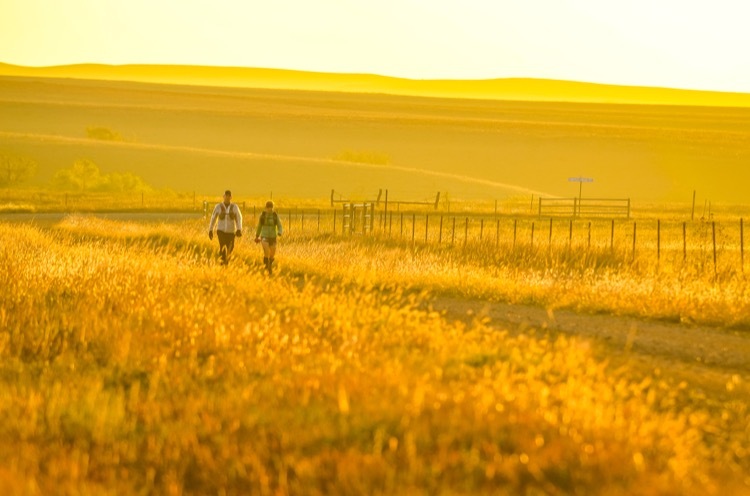 Runners in the Midwest are accustomed to walking the razor’s edge with the changing seasons. The old Mark Twain saying, “If you don’t like the weather… just wait a few minutes,” is often bandied about in spring and fall. 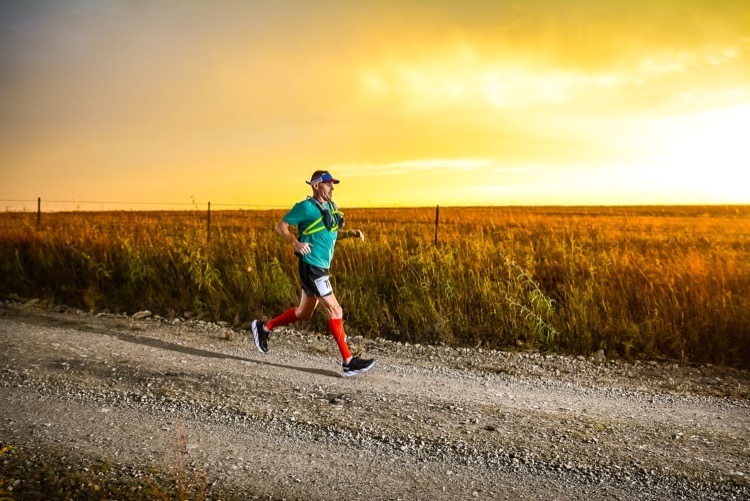 But a particular October cold front that draped across the Great Plains the day of the running of Heartland 100 in Cassoday, Kansas took that saying to the extreme. Standing in the dark at the start line, the 69 runners were already sweating. Warm, moist wind kicked up out of the south, diving into a reluctant mass of cold air to the north. 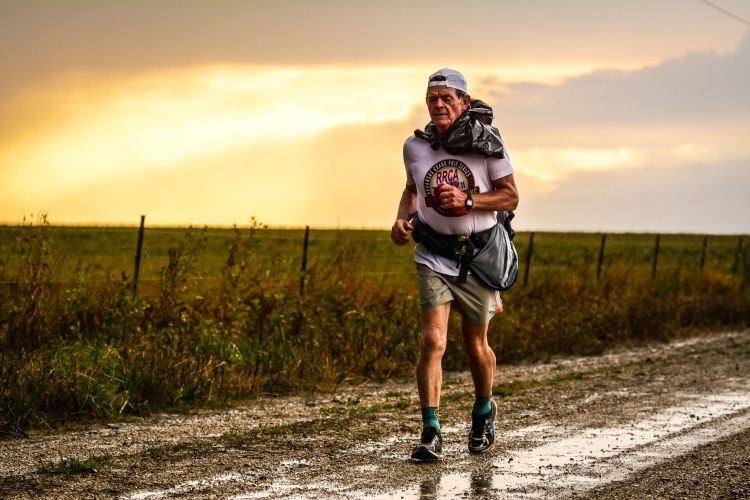 As the runners made their way east onto the exposed gravel and dirt roads of the Heartland course, thunderstorms with heavy rain and lightning were close enough for the rising sun to illuminate rainbows over their shoulders. Improbably, throughout the morning, the course remained dry. By noon, the temperature had warmed to 86°F and the wind was gusting up to 40 mph. A see-saw battle at the front emerged between Stephen Foster of Joplin, Missouri and Stormy Phillips of Tulsa, Oklahoma, with the pair drawing steadily away from the rest of the pack. Crystal Foust of Fremont, Nebraska and Jaclyn Long of Hoyt, Kansas were also in keen contention though the first half of the race. 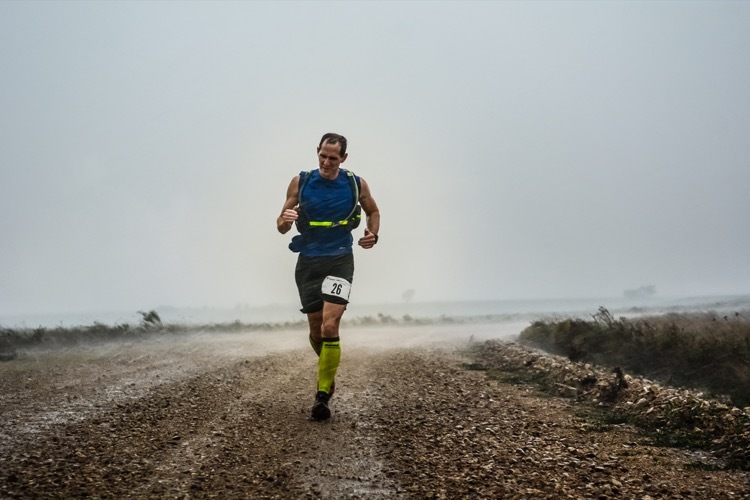 The toll being taken by the strong wind and high temperatures was evident in many of the runners, though, with common complaints of cramping and vomiting. All the while, dark clouds trailing curtains of rain loomed on the western horizon. They got what they prayed for. As many of the runners were grinding toward the 50-mile mark, those omnipresent storm clouds took on a more sinister appearance. A roiling shelf cloud barreled across the course, and behind it came 80 mph winds, stinging rain that blew in sideways, and pea-sized hail. 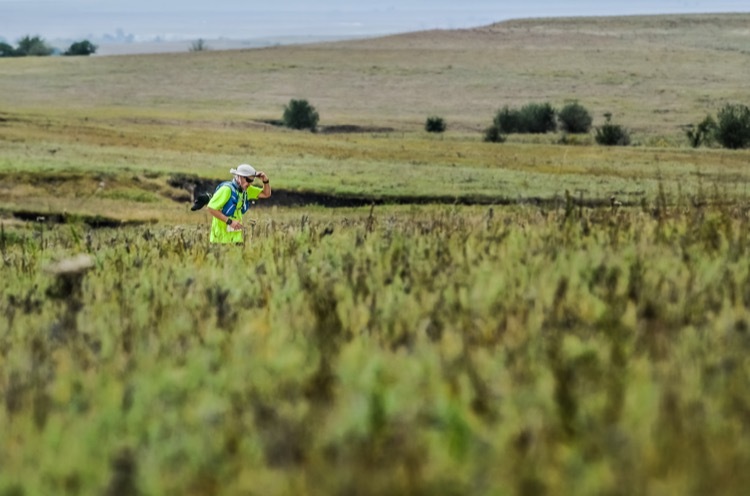 On the open course with virtually no trees or structures, runners had no choice but to trudge ahead. Aid station tents that hadn’t already surrendered to the day’s steady wind crumpled in the storm. Port-a-potties crashed to the ground. At one aid station, volunteers literally “held down the fort,” said aid-station captain Ben Holmes, each grabbing a pole of the pop-up tent to prevent it from flying away. At another aid station, volunteers parked cars on either side of the pop-up tent and lashed it to their frames. After the initial deluge, runners found themselves in a new season – fall – and quickly plunging toward winter. Lingering showers ensured the participants remained wet, and then the unyielding prairie wind rushed in behind the rain, dropping the temperatures into the 40s. Meanwhile, the effects of the heat earlier in the day were still being felt. When the sun went down, Foster had evaded all competition and drew further away from the field. He eventually finished with more than a 2.5-hour cushion over Charles Dodd of Manhattan, Kansas in second place. Foust emerged from the storm in 23:18, nearly three hours ahead of Windy Shull of Columbia, Missouri. 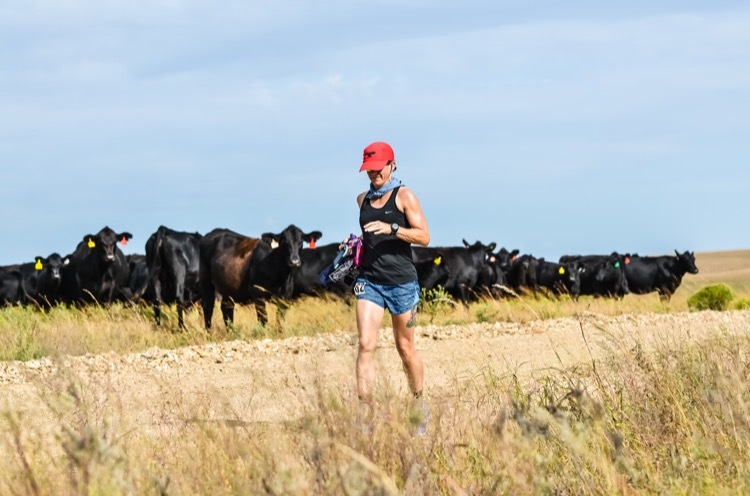 Seven of the 30 finishers also completed the Heartland Challenge—that is, successfully finishing the Heartland 50 in May and the Heartland 100 in October, in the same year. 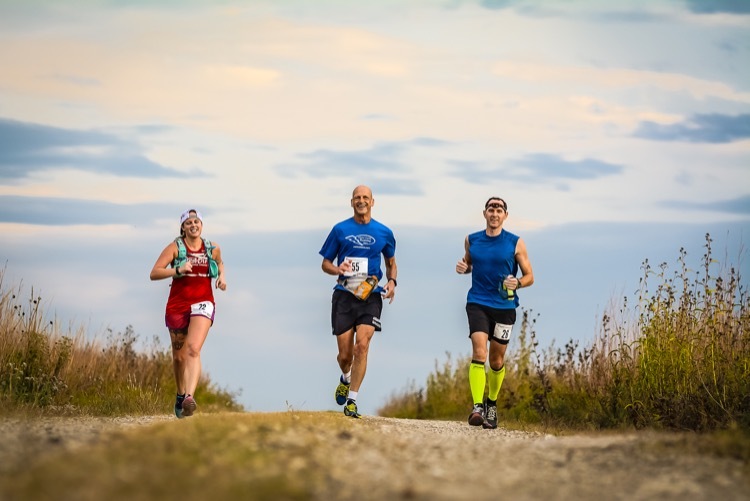 And two of those, William Sprouse and Adele Jordan, completed the 2017 Kansas Grand Slam of Ultra Running.